The United Food and Commercial Workers (UFCW) on Sunday announced that a tentative agreement was reached on a new contract for the 31,000 Stop & Shop workers who walked off their jobs on April 11 to protest the company’s proposed cuts to health care, take-home pay, and other benefits. The five UFCW Local Unions (328, 371, 1445, 1459, and 919) released the following statement in response to the deal: “We are incredibly grateful to our customers and everyone who proudly stood together with us every day for a contract that invests in the communities we serve, and makes Stop & Shop a better place to work and a better place to shop." Representatives from the AFL-CIO's departments gathered recently to learn about the United Way and it's online giving platform. They’ll be coordinating the United Way Giving Campaign for the labor federation’s headquarters and offices around the country. "I'm excited to work with my colleagues who step up every year to engage their coworkers in our United Way campaign and play a critical role in ensuring the campaign's success!" said AFL-CIO National Community Engagement United Way Program Coordinator Yael Foa. Last year, AFL-CIO staff raised $37,000 to support non-profits in their communities. "This is a great way to support organizations with values aligned with labor like the Community Services Agency of the Metro Washington Council, the only labor-sponsored agency in the Metro Washington area." said CSA Executive Director Sonte DuCote. The campaign will go from Monday, April 22 through Monday, May 6. 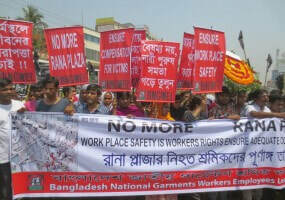 Six years after the deadly April 24, 2013, Rana Plaza building collapse killed 1,134 garment workers and injured hundreds more, the government is on the verge of rolling back international safety inspections even as employers and the government are blocking workers’ ability to exercise their right to form unions to improve working conditions. “Our managers make us tell the foreigners [safety inspectors] we don’t work until 10 p.m., that we receive our wages regularly and we even receive our doctor’s fees," says Konika, a garment worker. "None of this is true.” Read more at the Solidarity Center. Johnson is a striking deli manager and shop steward at the Stop & Shop in Somerville, Massachusetts; click here to listen to her on the AFL-CIO's “State of the Unions” podcast.